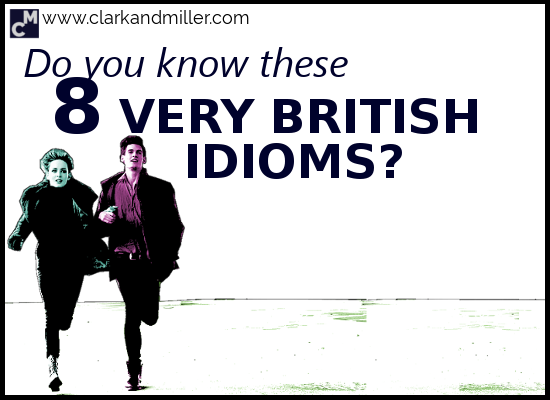 You’re about to learn 8 British idioms. Also check out 5 Common British English Words. So you can express yourself beautifully in English (partly thanks to our big tenses review, right?!). You know the tenses, your vocabulary is awesome, you know how to feel comfortable in different situations and you can describe the awesome and terrible people around you. So you feel more comfortable and start joining in English conversations more. Good for you! You rock! Idioms are not only a wonderful way of expressing yourself like an expert English speaker, but they also give you a great insight into how the culture of the language works. So today I want to introduce you 8 very British idioms. OK. How can I use it? Great. When can I use it? You can use it in any situation when you’re feeling (at least a bit) angry about something. But be careful: If you’re angry with someone, don’t say this idiom to their face — it might seem aggressive. Of course, if you really want to show your anger, then go ahead. But don’t blame me if they hit you, yeah? It’s something you don’t enjoy. We can also say “it’s not my thing,” which is a bit more common these days. But sometime in the 20th century, we started using it to describe things that we DON’T like. No, it’s not my cup of tea. Dolphin football’s not really my cup of tea. Running 10 miles in the winter wearing just a baseball cap isn’t my cup of tea. I prefer giraffe tennis. Good news. You can pretty much use this in any situation. It’s not rude. It’s not super formal but it’s not super informal, either. It’s right in the middle ground. But you can also use it with your best friend’s strange cousin. Possibly after he’s invited you to some more giraffe tennis. This idiom is usually used in competitive situations, like sports, politics or business. Manchester has been on the back foot for the whole match. Wow! The Prime Minister called a snap election! * That’s really put the opposition on the back foot. You’ll be happy to hear that you can use this one in pretty much any situation. It’s particularly popular in the world of politics. You can see why, right? British Idiom #5: It’s all gone Pete Tong! This is one of those idioms that you can only really use one way, and that’s by using all the words. It’s all gone Pete Tong. This one is definitely not one to use at work or with that weird-eyed woman I mentioned above. She really is weird. That’s because this one is very informal. So stick to using it with your friends and that very nice cousin! By the way, this is an example of Cockney rhyming slang. OK. And what can we say with this word “bone”? Sorry I didn’t answer the door, I was on the dog and bone. Sorry I didn’t answer the door, I was on the dog. I like this one, because it’s easy to imagine someone getting so angry that he loses his wig. Use this idiom when you want to tell someone that they’re getting angry unnecessarily. Be a bit careful with this one. If you use this with someone you don’t know well, they might get even more angry. Use it when you actually want to show that you’re getting annoyed with someone for getting angry. I guess the bun is the baby and the oven is the womb. She’s not drinking. She’s got a bun in the oven! You can use this in almost any situation except for formal ones. This one is, however, a little old fashioned, so you might want to avoid using it with your trendy 17-year-old niece (who, hopefully, doesn’t have a bun in the oven!). When something’s “on the blink” it means it’s not working properly. Probably because it’s too old. There’s also a strong implication that it’s come to the end of its life. Like a computer from the ’80s or the hipster movement (I hope!). We usually use this idiom to refer to things that use electricity, like computers, elevators or phones. This is quite informal but totally inoffensive. So just like “bun in the oven,” you can use it in any situation apart from when you have to go and meet the Queen of Sweden. Like you do every week, right? So these are 8 of my favourite British idioms. Do you know any other British idioms? Tell me about them in the comments! As an American English teacher, I’m less familiar than I probably should be with British idioms. I only knew 6 of these 8 idioms. Thanks for sharing! By the way, which expression do you think is the most frequent? Least frequent? Will you be sharing more short groups of useful British idioms? I don’t think I can make a call on which ones are most/least frequent. I mean … I don’t get to use “bun in the oven” so often due to circumstances. I get to use “on the blink more” but that’s also down to the situations I find myself in! I loved this article. Thank you very much. Wonderful post, just love to learn these great British idioms. Couple of them I’ve never heard before. Really interesting, thanks a million Clark and Miller. I’m glad you enjoyed these and got to add a couple of feathers to your bow! As an English person, I’d avoid saying “beyond the pale” with someone from Ireland due to the history of that expression. I’d also say ” keep your hair on” not keep your wig on. Absolutely good call about the use of “beyond the pale.” It brings up an interesting concept: When a phrase has established its own meaning beyond its original meaning, do the associations with that original meaning still continue? I use these idioms on a regular basis – guess it might be an age thing! Haha! Me too. They are pretty useful, yeah? Interesting. I suspect some of these might be geographically restricted – I’m Scottish and I’ve never heard Pete Tong before, or keep your wig on – it’s always keep your hair on. I would also be quite careful in using beyond the pale, but I have a lot of Irish connections, and it’s so easy to offend people. Good points all round Caroline. Especially with the Beyond the Pale one. Might not be cricket! And yes — there’s no escaping the fact that the Britain’s so damned linguistically diverse. As teachers I think the best we can do is teach what we’re familiar with and encourage our students to keep an open mind to alternatives. Most interesting. I just gave up dealing with p verbs. The list is so endless! Thank you. Some advice: don’t treat phrasal verbs differently from any other vocab. Would you try and memorise a list of random words? It’s the same with phrasal verbs — just learn them as they come (from reading, TV, talking, lessons or wherever you usually pick up vocab). Now I am curious about the history of Beyond The Pale, not to mention a lot of the other ones. I’m also an American in the US, so a lot of these I’m not so familiar with. Is Pete Tong a person? Obviously, I could research these, but it might be interesting to have them be a footnote of this article. Thank you for publishing it It was wonderful! Yes. The phrase “beyond the pale” actually has some echoes from colonialism. “The Pale” was the area around Dublin originally under British (well, Norman at that time) control when they invaded in the 12th century. The implication is that anything outside their jurisdiction was uncivilised and wild. Thanks for your comments and I’m glad you enjoy the posts! Thanks a lot! I’m a foreign learner from Russia. I’m keen on idioms, so about half of them were familiar to me. But there were also some I’ve never heard about! And I like your style and brilliant sense of humor! Thanks! Useful, amusing, helpful! It’s great to hear from people who are fond of idioms! I’m really glad that even with your keenness of them, I was still able to help you out. And thanks for the positive feedback — much, much appreciated! Yes — emails, SMSes and chat language is something that’s becoming more and more part of our language. Expect to see a post on this soon — and thanks for the suggestion! Awesome work. I am familiar with all the idioms. That’s great, Susan. Great work!